Volume 6, Issue 43; October 25, 2006: What Makes a Good Question? 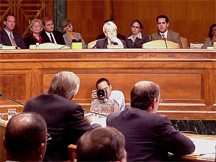 A hearing in the U.S. Senate, in which Defense Secretary Donald Rumsfeld is responding to questions about appropriations. Confrontational questioning rarely elicits complete truth. Photo courtesy U.S. Senate. Suddenly, everyone in the room felt the tension. On the surface, Harriet had asked a simple question: 'When will Marigold complete the Phoenix test suite?' It wasn't her tone; it wasn't even the question. Everyone wanted to know the answer. And it wasn't Terry's answer — he responded coolly: "Friday, we think." Everyone was tense because of the fear that Terry might lose control, and because everyone knew that he would have provided the answer without being asked. Harriet's question was gratuitously challenging, and everyone knew the answer would be embarrassing for Terry. Gratuitous challenges are just one of many kinds of questions that cause tension at meetings. But what makes a good question? Here are some insights to help you frame questions that advance the conversation. An unnecessary question is one that you could have answered yourself if only you had given it a little thought. Unnecessary questions derail the meeting and waste time. But the asker pays the highest price: degraded reputation. Most unnecessary questions result from not thinking, from inattentiveness, or from obsessive attempts to prove one's value. A question that takes the group away from its task can be frustrating to everyone, especially if the meeting is running longer than anticipated. Once people feel frustrated, work quality declines. For the rare off-topic questions that do need to be asked, either wait for the right moment, or ask for the group's permission. When you set up a confrontation, you increase the chances of destructive conflict. Whatever happens next is usually bad news, and doesn't advance the group to its goal. Some askers of confrontational questions don't realize what they're doing. Most do. To be safe, be self-effacing. Err on the side of too much courtesy and too much respect. When you do have a question, let it age a little. You might think of the answer, or if someone else asks it, you'll get the answer. If no one does ask, you can. Some feel that to really score points, we must know the answers to our questions. Then, when people don't have an answer, the asker can come to the rescue. The most likely outcome of such an approach is resentment of the asker. Ask questions only when you sincerely want the answers. Would you like to see your comments posted here? rbrenygZxByxWDPdRvCvIner@ChacvjMDXjeSkhBEjhPeoCanyon.comSend me your comments by email, or by Web form. Renewal is a time to step out of your usual routine and re-energize. We find renewal in weekends, vacations, days off, even in a special evening or hour in the midst of our usual pattern. Renewal provides perspective. It's a climb to the mountaintop to see if we're heading in the right direction. Whether or not you work as part of a virtual team, you probably work with some people you rarely meet face-to-face. And there are some people you've never met, and probably never will. What does it take to maintain good working relationships with people you rarely meet? See also Personal, Team, and Organizational Effectiveness, Problem Solving and Creativity, Conflict Management and Effective Meetings for more related articles. I offer email and telephone coaching at both corporate and individual rates. Contact Rick for details at rbrenLOmEitBemteOCEnYner@ChacKrHhveGavYivzQTjoCanyon.com or (650) 787-6475, or toll-free in the continental US at (866) 378-5470.